I have covered many memorable Triple Crown races and Breeders' Cup Classics over the years, and while American Pharoah's Triple Crown sweep will always remain close to my heart, being the final three races I covered for the Blood Horse, the most incredible story of them all, the kind that reads like pure fiction, was the unforgettable victory in the 2013 Breeders' Cup Classic by Mucho Macho Man, the horse who was born, then seemingly died, and miraculously sprung back to life on Father's Day. So, once again, with new material added, here is the amazing saga of Mucho Macho Man and his trainer Kathy Ritvo, and in supporting roles, owners Dean and Patti Reeves, breeders Carole and John Rio, jockey Gary Stevens, and racing manager Finn Green, all with compelling stories of their own. It couldn’t have ended any other way. There simply was too much magic at work. 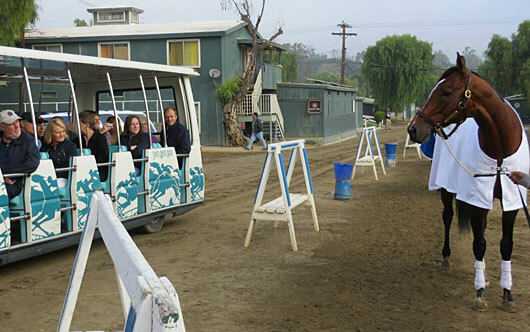 And everyone who was at Santa Anita on Nov. 2 could feel that magic. The fairy tale journey of Mucho Macho Man and trainer Kathy Ritvo began five years ago, and after watching the towering 5-year-old son of Macho Uno – Ponche de Leona, by Ponche win the $4.6 million Breeders’ Cup Classic (gr. I) and experiencing the emotional aftermath, one had to feel that destiny was guiding the two all the way, and that this special moment in time was preordained. It was Ritvo’s fight for life after being so close to death, stricken with the heart disease cardiomyopathy, a severe deterioration of the heart muscle, and her incredible will to live that brought her and Mucho Macho Man together to share something so special it brought waves of rapturous cheers and, yes, a few tears. Ritvo had thought this moment would come a year earlier, but a heartbreaking defeat in the Classic seemingly had put an end to the dream. The wait for the horses to emerge from the tunnel seemed interminable. A woman stood alongside the fence near the gap holding a sign that read, “Team Mucho Macho Man Has Heart (with the heart represented by a bright red heart). The track bugler walked by and when he saw the sign he went over to the woman and began playing the song “Macho Man” by The Village People. A few minutes later, the horses finally appeared. Ritvo, just as she had done last year, stood by the rail near the gap as the Classic field paraded to the post. Because of her diminutive size, she had to step on a small stool to get a better look. But she was still too far away to see the entire stretch, so she stepped up on a ledge and leaned her body over the rail. When Mucho Macho Man’s name was introduced in the post parade, a cheer went up from the crowd, and even Ritvo applauded her horse with gentle claps. She could see jockey Gary Stevens, who was on a magical journey himself, move Mucho Macho Man into a perfect position down the backstetch and she could plainly see him gun the big horse to the lead at the five-sixteenths pole, unlike last year when “Macho” was forced to try to get past a stubborn Fort Larned and couldn’t do it, falling a half-length short. Now, he was in front, with his ears up. Stevens, who has made a remarkable comeback after being retired for seven years, had won the Awesome Again Stakes (gr. I) on his first mount aboard Mucho Macho Man and felt the urge to go to the whip, but refrained, knowing the horse was giving him everything he had and disliked being whipped. Ritvo began cheering her horse on as he led by daylight inside the eighth pole, but here came another giant of a horse, Travers Stakes (gr. I) winner Will Take Charge, bearing down on him from the far outside, with the Irish invader Declaration of War closing ground in between the two. When they hit the wire, Ritvo felt confident she had won when she saw Stevens give a little celebratory shake of his whip. Others around her, however, weren’t as confident. When they showed the replay a gasp went up from the crowd as they hit wire. 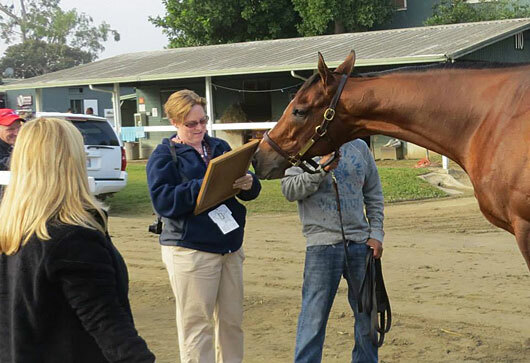 Could it be that Will Take Charge had stuck his nose in front? Ritvo now began having feelings of déjà vu. 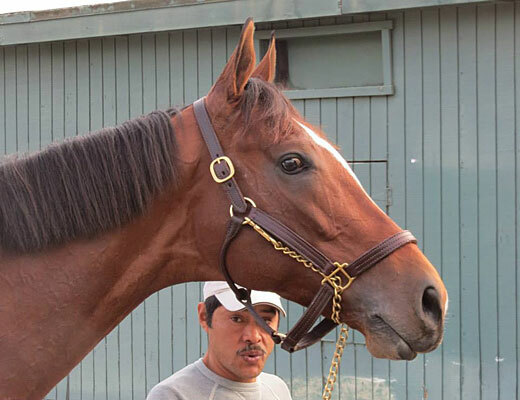 Had Mucho Macho Man suffered another heartbreaking defeat? Could fate be so cruel as to lead them here again only to end in failure? The stretch run was replayed again, and this time Ritvo kept urging her horse on, as if watching the race live. “Come on, buddy. Come on, buddy,” she pleaded in a soft tone. Then came a feeling of dread when the camera switched to Will Take Charge on the infield screen just as the unofficial results sign went up. But a second later, the number “6” went up and the announcement was made. Mucho Macho Man had won the 30th Breeders’ Cup Classic. The dream was complete. Ritvo’s mother has been in the hospital for several weeks with heart problems. Ritvo’s husband, Tim, who is the president and general manager of Gulfstream and who actually trained Mucho Macho Man when the horse broke his maiden, came over and the two embraced. The Ritvo’s two children, Dominique, 21, and Michael, 19, had to endure their mother’s debilitating illness starting when they were 9 and 7. “They lived through the worst of it and were always very supportive.” Tim said. Michael, who aspires to be a rider, walked around as if in a daze, a perpetual smile on his face. The story of Ritvo and Mucho Macho Man and Stevens and majority owners Dean and Patti Reeves have so many intertwining plot lines it would difficult to make it up and get away with it. The story began in 2008, as Ritvo lay in a hospital bed in Miami Fla., hooked up to an IV of dopamine, a heart muscle stimulant that was keeping her alive. In 2000, she had gotten pregnant with their third child and was almost five months along when she was diagnosed with her illness and the pregnancy had to be terminated. Ritvo’s daily regimen of medication sounded like drugs gone wild – 12 anti-rejection pills at 7:30 every morning, 15 vitamins at noon, and eight more anti-rejection pills at 7:30 at night. As Ritvo struggled to stay alive, some 250 miles away in Ocala, Fla., a strapping bay colt was born on June 15 at Carole and John Rio’s farm that they leased, unusually late for a Thoroughbred. The 9-year-old Ponche de Leona had been three weeks overdue and the Rios were staying up day and night waiting for her to foal. It was Father’s Day when the Rios were returning to the farm after attending to Carole’s champion miniature pinchers and received a call from farm manager Jeff Sekay telling them the mare was foaling. “Oh damn,” said Carole, who didn’t like foaling mares out in the field. When they arrived, Sekay and his wife were standing over the foal’s seemingly lifeless body and were praying. After several minutes and no sign of life, the foal was feared dead. Carole started rubbing him and then stopped and began praying herself. Five months later, on Nov. 13, as the weanling colt, later to be named Mucho Macho Man, romped about in his paddock, Ritvo also “rose” from the dead following a successful heart transplant, for which she had been waiting for what seemed an interminable amount of time. When she awoke from anesthesia, she took a deep breath, something she hadn’t been able to do for years, and in six months was back at the racetrack training horses. As if in a movie script, Ritvo and Mucho Man Man would one day unite and embark on a journey that would lead them to a third-place finish in the Kentucky Derby, five weeks before the colt's actual third birthday, and two years later to the winner’s circle of America’s richest horserace. That ended the first chapter of the Mucho Macho Man story. The second chapter began when the colt was purchased from the Rios by Jim Culver of Dream Team One Racing. Culver had watched the colt develop and grow and had a feeling he would be something special. When he was entered for his career debut at Calder, trained at the time by Bill White, he had to be scratched when the horse in the stall next to him flipped in the gate and he got nicked up enough to be withdrawn by the veterinarian. When he was entered back seven days later, he finished a strong second to a highly touted colt named Gourmet Dinner. At the time, the Reeves’ were looking to buy a young horse and had been touted on Gourmet Dinner. Dean watched the tape of the race with the intention of purchasing the colt, but after the race he uttered the words that would change his and Patti’s life forever: “I like the second horse.” So, he contacted Culver and bought majority interest in Mucho Macho Man, eventually buying out Dream Team One Racing. When Mucho Macho Man was a yearling in 2009, the Rios consigned Ponche de Leona to the Ocala Breeders’ October mixed sale, a move Carole was against. She felt even worse when, because of a miscommunication regarding the mare’s reserve, she sold for only $5,000. But because of legal issues surrounding her new owner, Carole was able to buy her back, enabling that chapter to have a happy ending as well. The Reeves were Tim Ritvo’s clients and they gave him the horse to train. While Tim was up in New York, Kathy was helping out at the barn in Florida. It was Kathy who went to White’s barn and vetted him for the sale, along with Dr. Scott Hay. After the deal was completed, she galloped the colt for a couple of days and fell in love with him. She then sent him to Tim in New York. When Tim took the job at Gulfstream shortly after, he convinced the Reeves to keep the horse with Kathy and one of the sport’s great marriages was born. 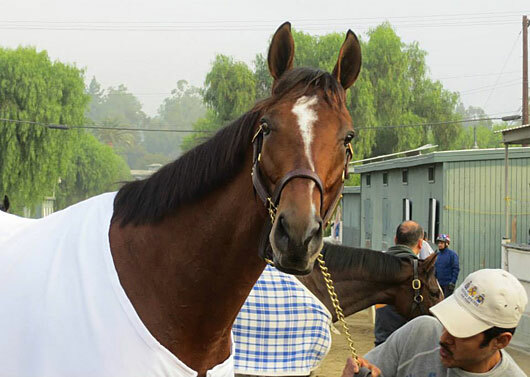 Mucho Macho Man’s 5-year-old campaign was compromised by a virus and bacterial infection early in the year. 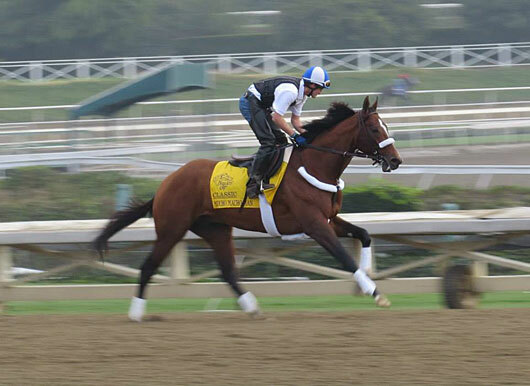 While training for the Met Mile (gr. I) he suffered a quarter crack and was forced to miss the race. After returning and finishing third in the Criminal Type Stakes and Whitney Invitational Handicap (gr. I), it was decided to put Gary Stevens up and send the horse to Santa Anita to prep for the Classic in the Awesome Again Stakes (gr. I). Stevens, who had been struggling with pain for several years, was involved in a horrific spill at Arlington Park that could easily have cost him his life, but he made an amazing comeback from that near-tragic incident. He continued to live with extreme pain in his knees before finally retiring in 2005. Over the years he briefly trained horses, was racing manager for Prince Ahmed’s The Thoroughbred Corp, was an advisor to IEAH Stables, worked as a TV analyst for several networks, and even acted in movies and television, getting excellent reviews for his roles in the film “Seabiscuit” and the short-lived TV series “Luck,” in which he played veteran washed-up jockey Ronnie Jenkins, who had turned to alcohol following a bad spill. Following Luck’s cancellation, Stevens, remarkably, after seven years, decided to come out of retirement, as if continuing his role as Ronnie Jenkins, intent on proving to the world he still could ride with the best of them. To most everyone’s amazement, Stevens returned as strong and as fiercely competitive as he had been back in his glory days of the 1990s. He lost none of his strength and timing and his comeback was an immediate success, highlighted by his victory aboard Oxbow in the Preakness Stakes. His fellow jockeys were amazed he could come back off such a long layoff at the age of 50 and compete at the same high level he had seven years earlier. 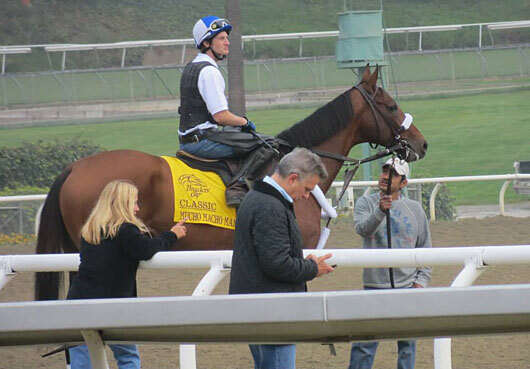 Now, here he was aboard a horse who had an excellent chance to give him his first Breeders’ Cup Classic victory. Mucho Macho Man had a unique record going into the Awesome Again. Since his career debut at Calder he was six-for-six when he had the lead at the eighth pole and 0-for-14 when he didn’t. Stevens gunned him to the front on the far turn and drew off to a 4 1/4-length victory. Now, Mucho Macho Man was seven-for-seven when he had the lead at the eighth pole. The strategy for the Classic seemed pretty simple. The Classic attracted a deep and talented field of 11 with the scratch of Ron the Greek due to a quarter crack. Sent off at 4-1, Mucho Macho Man actually outbroke the field and held the lead briefly until Stevens took him back and let him settle off the pace in fourth. Game On Dude, the 8-5 favorite went to the front, as expected, dogged by Moreno and Fort Larned. After a quarter in :23.39, Moreno took a short lead over Fort Larned, as Game On Dude slipped back to third, followed by Declaration of War, who was showing excellent speed in his dirt debut under jockey Joseph O’Brien, son of trainer Aidan O’Brien. Mucho Macho Man was right alongside, as they hit the half in a solid :46.36. As they rounded the far turn, Fort Larned had a half-length lead over Moreno and Game On Dude, with Mucho Macho Man ready to pounce from the far outside. Declaration of War was hanging tough behind horses, as Palace Malice, who had broken slowly and dropped back to last early, made a bold move to reach contention, with Will Take Charge being pushed along behind him. Palace Malice was ridden by Rafael Bejarano, who replaced John Velazquez, who was taken to the hospital following a spill in the Juvenile Fillies (gr. I). But Will Take Charge was now flying on the far outside, with Declaration of War, still on his left lead, closing fast as well. The three hit the wire in a photo, with Mucho Macho Man getting the narrowest of decisions over Will Take Charge, who was a head in front of Declaration of War. It was another 3 1/4 lengths back to Fort Larned in fourth. The final time for the 1 1/4 miles was 2:00.72. Ritvo had become the first female trainer to win the Breeders’ Cup Classic. For Finn Green, he was experiencing his own miracles. While Mucho Macho Man and Ritvo virtually came back from the “dead,” Green had come back from hell. It was the hell of a failed business, a failed marriage, a failed relationship with his daughter, and his and his daughter’s own losing battles with alcohol that left him teetering on the edge between life and death. But in the end it was his faith in God, his strong will, and his new-found relationship with his daughter that eventually led him to Dean and Patti Reeves and Mucho Macho Man. After getting sober and helping his daughter with her problem and reestablishing their relationship, Finn, whose father had managed Greentree Stud for many years, got back into racing. 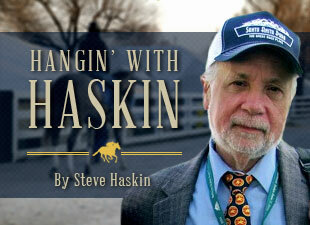 He went to the Keeneland September yearling sale, where he fell in love with a yearling filly selling as Hip No. 703. All he had to spend was $50,000, and after the bidding reached his limit, he upped it to $55,000. His final bid actually stood for a brief while, but was upped to $60,000 and the hammer fell. Green had missed by $5,000 of purchasing the filly, later to be named Zenyatta. He eventually got a job with Taylor Made Farm as business developer and had started following the career of Mucho Macho Man after the colt’s second-place finish in the Remsen Stakes. He contacted Dean Reeves and met him at Gulfstream Park and told him he was the business developer at Taylor Made, and because the Reeveses were new in the horse business he wanted to reach out and introduce himself. Needless to say, there was plenty of happiness going around following the Classic. But for one Hall of Fame trainer, there was the agony of getting beat by inches. As Dean Reeves walked back through the tunnel after the race, Wayne Lukas, trainer of Will Take Charge, came over to shake his hand, but was noticeably crushed by the defeat. “That one tore me up,” he said. Aidan O’Brien, who had won the BC Turf with Magician, was thrilled with Declaration of War’s performance, as well as the ride by his son. Emotions continued to run high well after the race. Dean Reeves’ sister, Camilla Ellenburg, wept as she hugged her brother, and then sought a spiritual meaning to Mucho Macho Man’s victory. Meanwhile, in Ocala, Carole Rio watched the Classic at a local restaurant and was extremely confident, but for an unusual reason. “My miniature pincher, who is ranked number 3 in the country won her record 108th Best in Show on that same Friday and Saturday, and when I got the text she had won I knew Mucho Macho Man was going to win, because every time she wins a Best in Show, he comes right back and wins a race immediately afterward,” Rio said. “It’s unbelievable. The bond between humans and horses has been romanticized for centuries. Who can explain why Mucho Macho Man and Kathy Ritvo were destined to travel the same path in life and why that path led them to glory on racing’s biggest stage? From a physical standpoint, Ritvo is dwarfed by the towering Mucho Macho Man, but their hearts, which once had seemingly gone silent, now beat as one. And nothing as mundane as a photo finish camera was going to deny this fairy tale its happy ending. Sometimes, a simple revelation can have such profound meaning. But it was Dean Reeves who summed up this magical day best and put everything in proper perspective.